It all started with the need to connect human interfaces to computers. Due to the lack of dedicated keyboards and monitors, teletypark equipment was adapted in the 1960s. These large-format typewriters were used to enter data and commands and to communicate their results - by printing on a developing paper tape. It is the English name of the telex (ang. Teletype) still on Unix systems System terminal emulator device has an address that contains a shortcut tty eg. /dev/tty1 . No wonder that the first programs created for computers communicated with their operator using a line of text. The operator introduced the command, pressed return (which then meant the real return of the carriage ), and in the next lines, on the same paper, received the result. It was at that time that the possibility of line numbering was created in some programming languages ​​- it was the only possibility of arranging a written program line in sequence. We could still observe the editing of files in this way in the edlin line editor present in all classic versions of DOS. In a simplified way, it can be said that the next stage in the development of interaction with computers was the so-called teletype glass - the precursors of terminals. These were input-output devices connected to the computer, providing the ability to write on the keyboard and display results on the glass screen. They successively replaced teleprinters during the 1970s. On the desks of computer operators, devices equipped with a CRT display appeared, having the possibility of displaying simple alphanumeric text most often. The first generation was baptized with a dumb terminal - because most of the processing of what is displayed on the screen was done on the server. It was at that time that many important standards for displaying text on screens were born today. For example, basic keyboard shortcuts, control codes, displaying characters in single columns ( monospace ), and using ASCII characters to imitate otherwise impossible to achieve graphics and creating frames. 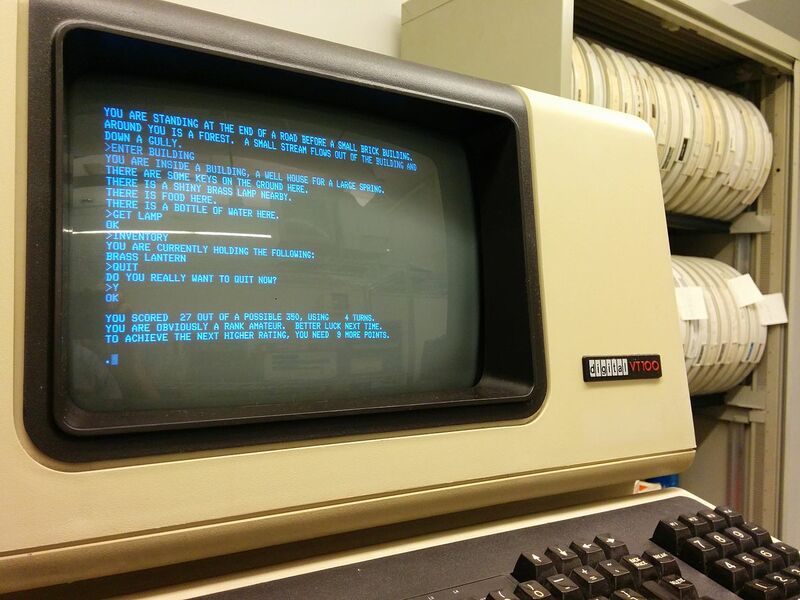 Here is a short selection of the earliest text games that appeared on terminals. Educational game about settling travel through America in the 19th century. It was created in three weeks, and the first versions allowed to play even teletype ( hardcopy termina ). The user was issuing commands and then watching the computer's reaction. The task was to make the settlers safe by the title trail of oregoński. Various dangers such as diseases, attacks of wild animals or ending wrestling were waiting for them. The player moves (mainly in the imagination) in the labyrinth of rooms. In one of them is the title Wumpus, on which we try to hunt. Unfortunately, in some chambers there is a chasm waiting for us, in some other malicious bats that will take us to another random chamber. There are three exits from each chamber, there is darkness in them and we only have information that "we feel Wumpus" or "hear bats" in one of the neighboring rooms - in this respect the game looks a little like Saper. The game is also known as ADVENT (from the file name) and simply Adventure. Adventure game in which we explore the title cave. This is the first game belonging to the interactive fiction genre - an interactive plot. It is difficult to overestimate her influence on later games - she was a precursor in many respects. Drawing on the Colossal Cave , the creators of Zorka developed the concept of an interactive plot. The first game, created on the DEC PDP-10 computer terminals, began the entire series that lasted several decades. Games from the Zork series were created for other platforms, and the first game is playable, for example during the game in Call of Duty: Black Ops . In the book " Player One" it was just ending Zorka that the hero received the Jade Key (the thing that was changed in the film version). In times closer to today, text games were created in which the choice of text instead of graphics as a medium was often dictated by aesthetic aspects, an attempt to facilitate the production process, or showing that what counts here is more content than form. In recent years, this is often a conscious reference to retro aesthetics. In particular, the creators of several game genres have enjoyed creating them in text form. Career games roguelike began with the game Rogue, I was created in 1980 on Unix terminals. Game developers probably did not expect that they will start the existence of a whole game genre, which will then inspire hits such as Diablo, and will be present in thousands of versions for all platforms. The visual concept is of course drawing dungeons with ASCII frames, presenting the hero and opponents as letters and moving and issuing commands using the keyboard. Roguelike was also characterized by the hero's real death, after which we had to start the game again. In some of the games we were able to recover some of the contents of the equipment - for example, in Nethack you can find the body of our hero in the next game thanks to the so-called. bone files . Another characteristic feature were randomly generated dungeons - each time the game looked different. The development of the Roguelike concept is the Rogue-lite genre - which derives only a part of the features of these games. Rogue-lite games are, for example, Pokemon Mystery Dungeon, Rogue Legacy or Dungeon of the Endless. The species started by Adventure is doing well until today. Scenarios for text adventure games were created by well-known authors (eg Douglas Adams), and today interactive fiction remains a significant niche of independent games. Some of them (eg thanks to Infocom) turned into adventures with graphics. You can play a huge selection of interactive story games on mobile devices. Just download the Frotz application (the name of the engine to run such games) available on Android and iOS. The Interactive Fiction Database page stores the archive and information about games of this type. We can also play Adventure classics online - we can easily find interpreter in the network that allows you to play directly on the website. With the help of ASCII characters, we can also play action games. In the 90s a series of games was created, distributed on the basis of the Shareware named Kroz (beginning with Kingdom of Kroz). The name refers to Zork - and the plot to the adventures of Indiana Jones. We visited in these games (which together created two trilogies) various undergrounds and forgotten temples, in which we solved simple puzzles and fought with hordes of literal opponents. The creator of Kroz was Scott Miller himself - co-creator of Apogee Games and 3D Realms, and co-producer of such games as Max Payne or Prey. Today games from the series are available as freeware , including the source code. The phenomenon of ASCII action games was ZZT. Along with its sequel, Super ZZT, the game became popular among the creators of their own levels. It was very easy, and ZZT was one of the first real game engines. To this day, we find the network of enthusiasts of this game, creating new additions in it. Who is the creator of ZZT, you ask? Well, Tim Sweeney himself, today worth almost $ 10 billion. founder of Epic Games. From the remaining games that do not match the existing framework, it is worthwhile to exchange two more contemporary games. The first is SanctuaryRPG. We can buy it on Steam , and its inspirations are Japanese RPG, Dark Souls and Roguelike games. The second is a game that, despite the graphics of ASCII, is a complicated simulator of the whole world, and the gameplay in it can take weeks. The game has a huge crowd of supporters and fans who can even write novels happening in her world. This game is of course Dwarf Fortress.